Monsieur is Beaucoup’s brother from the first litter for his dam, Ch Kimlise La Cygne, and was whelped in June 2013. In October 2013 Monsieur was Baby Puppy in Show at the NSW Hungarian Vizsla Club Specialty Show. 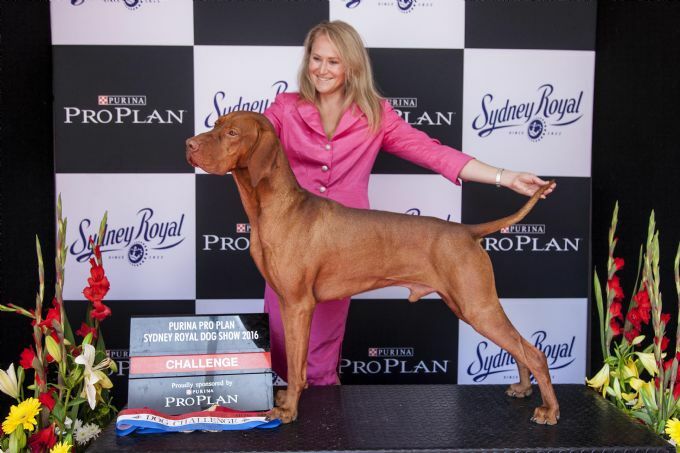 In 2015 Monsieur was ranked No 1 Vizsla Breed Challenge in NSW*. DOG CHALLENGE, PURINA SYDNEY ROYAL EASTER SHOW 2016 under Mrs A Carlström (Sweden). BEST EXHIBIT IN GROUP under Dr Karen Hedberg (NSW). In 2018 Monsieur won RUNNER UP TO BEST EXHIBIT IN GROUP at the prestigious North of the Harbour Show. Monsieur won Puppy Dog of Breed at the Purina Sydney Royal Easter Show 2014, and was beaten for Puppy of Breed by his sister, Beaucoup. He was also shortlisted in Puppy Sweepstakes, handled by Nikki Zullo. way. Nice topline going into well turned stifles and good drop down of hock"
Monsieur is an affable outgoing character who typifies elegance and substance, power and self-containment. He has inherited his mother’s ‘gift’ for self-expression, and is as at home in the water as he is on land. Like his mother, in 2015 he qualified to participate in the NSW Government’s Responsible Pet Ownership program, a reflection on his easygoing nature and affability. He measures 62 cm tall.